Scholars of early modern Protestantism commonly assume that the historical, text-critical and philological scholarship pioneered by Renaissance humanists had little bearing on the average Protestant reader’s engagement with the Bible. This assumption structures recent work on the differences between ‘Reformation’ and ‘Enlightenment’ literary and intellectual culture; the role of early modern Protestant scripturalism in laying the groundwork for modern fundamentalist and evangelical movements; and on the purposes, effects, and confessional valencies of vernacular biblical translations. This paper argues that scholarship was in fact fundamental to early modern Protestants’ ideas about the Bible’s meaning and authority. Academic and non-academic readers of the Bible were united by shared interests in the authorship and transmission of the biblical text and canon; questions about the Bible’s coherence and reliability; and the utility of non-biblical sources and philological techniques for clarifying its meaning. Their attention was drawn to these issues by an international culture of vigorous inter- and intra-confessional debate about them, which was conducted not only in Latin but also in the vernacular languages. 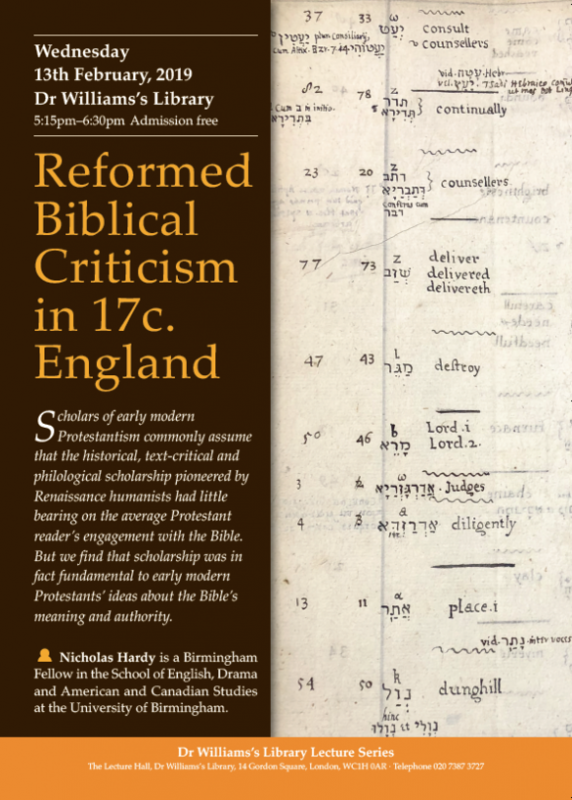 This confessionally inflected scholarship provided the yardstick by which English biblical translations were judged throughout the seventeenth century, but it also played a part in larger developments, including the ongoing struggle over the identity of English Protestantism itself. Nicholas Hardy is a Birmingham Fellow in the School of English, Drama and American and Canadian Studies at the University of Birmingham. Apart from his recent monograph, Criticism and Confession: The Bible in the Seventeenth Century Republic of Letters (2017), he has published on the early modern reception of the classical poet Lucretius, and on the King James Version of the Bible. He is currently working on the vernacular contexts and readerships for biblical philology in seventeenth-century England. My primary interests are in sixteenth and seventeenth century literary and intellectual history, especially Renaissance humanism, the reception of classical antiquity, neo-Latin literature, and religious writing. I recently published a monograph about the relationship between classical humanism, biblical criticism and confessional identity in seventeenth-century Europe, and am now preparing a study of the King James Version of the Bible (1611) based on previously undiscovered sources.